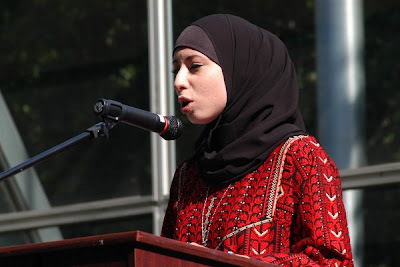 Traditional clothing from all over the world is often inclined towards modesty, and I reckon it's about time I featured traditional Palestinian clothing. Recently, Palestinian fashion became synonymous with the kaffiyeh, which rose to popularity as a fashion statement and has even been worn by the likes of David Beckham and the Olsen twins. 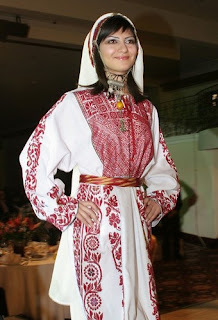 However there is much more to Palestinian clothing, which centres around rich embroidery in red and blacks and caps and headdresses which can, and often are, incorporated with hijab. 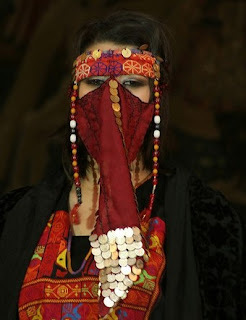 Visit the Palestinian Heritage Foundation to learn more about the history of Palestinian costume. salam sis, thanks for sharing, i love how colourful the garments are. The niqab pictured, i bought one like that from Ebay, and i love it and love the opportunity to wear it, unfortunatley i am in the UK, so i think people would stare etc to much. 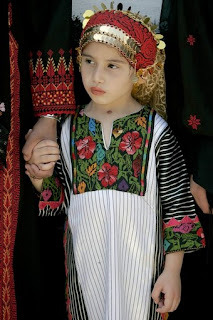 Palestinian embroidery is exquisite. Thank you for the post! Wow, wow, wow....a visual delight. so beautiful and colorful. So beautiful and so timely! I live about 2 hours south of there, I wish I had known before it happened, I would have attended! I love the rich thread emboidery and design especially in the more traditional colours of red and black. And as the video says, it just shows again how strong and resilient a people, palestinians are, mashaAllah. 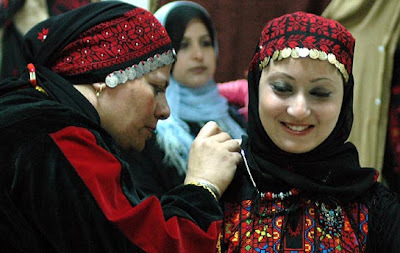 I agree with the sisters - Palestinian embroidery is truly beautiful and all hand made! SubhanAllah imagine the patience they must have :)! mmm, wow what beautiful pics.. 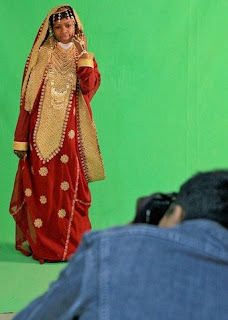 I love Palestinian traditional costumes. 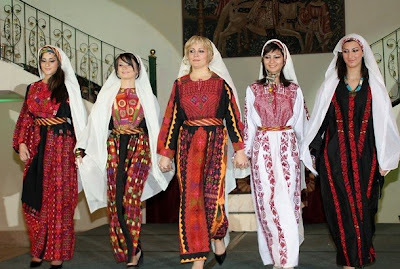 The one from Ramallah in particular (the white gown with red stitching)reminds me of our traditional costumes (I'm romanian). Salaaam everyone!! Cool blog hey!! I'm south african and absolutely love anything and everything palestinian!! I'm very palestinian lol!! So I've been down last year n bought few traditional outfits but naaaaaah I'm not satisfied!!! I wana buy more, when I return back to my beloved palestine yet again this year!! I have a bbm group I've set up regarding palestinian n arab fashion, and now I'm snooping around for any info and updates I can procure..... Found good stuff here I can say! Thanx n shukran! I found a couple of books that are just so unique about Palestinian embroidery, not sure if anyone heard of them. One was called "Threads of Identity" by Widad Kawar (she has the largest collection of Palestinian traditional dresses in the world) and I got this book in Amman, it is so amazing and it has the stories of the women who made their dresses in Palestine. Its so human and beautiful. Another book I loved, and a must have for any designer, is called "Palestinian Embroidery Motifs" by Margarita Skinner (also in association with Widad Kawar) I have yet to see a book like this, it shows over 200 design motifs, their names and origins from Palestine.